British soft drink manufacturer Britvic has launched a new advertising campaign for Drench® water focusing on mental hydration. Well known brains trust The Thunderbirds have been recruited to showcase the bottled water’s powers. 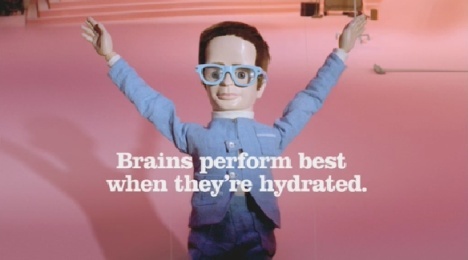 The TV and digital campaign uses the puppet Brains from the Thunderbirds television series (from the 1960s) to show that brains perform best when hydrated. Brains dances around a set to the sounds of Snap’s 1992 hit, “Rhythm is a Dancer”, energized by Drench. “Your brain’s 75 % water”. The Brains performance was developed at CHI & Partners, London, by executive creative director/art director/copywriter Ewan Paterson, and agency producer Ben Clark. Filming was shot by director Ringan Ledwidge via Rattling Stick, London, with director of photography Ray Coates and producer Sally Humphries. Offline editor was Richard Orrick at Work Post. Production designer was Nick Foley Oates. Post Production was done at The Mill by producers Gemma Smith and Laura Brooks, 3D Animators James Sindle, Jesus Parra and Josh Fourt-Wells, VFX supervisors on shoot: Hitesh Patel & Rich Roberts, and Flame Ops Barnsley. The Brains puppet was made by John Roberts at Puppet World. Lead Puppeteer was Ronnie Le Drew, with puppeteers Sarah Wright, Sue Dacre and Libby Granger. Audio post-production was done by Aaron Reynolds at Wave Studios. ‘Rhythm is a Dancer’ by SNAP was accessed courtesy of Luma Music, Universal publishing and Warner Chappell publishing, with strategic music consultancy by Dave Bartram at The Band Brand Association. The Drench Brains ad, and soon the making of the ad, are available to watch at www.drenchwater.co.uk.